Using a large pot, bring half of the water to a boil. While the water is heating, add the salt, celery, carrot, onion, leek, garlic, thyme, bay leaf, juniper berries and peppercorns. Once the pot reaches a boil, reduce the heat and simmer for one minute. Add the remaining half-gallon of cold water and chill. Place the raw beef short ribs in the chilled brine for 8 hours or overnight in the refrigerator. In a 5-quart stock pot, add wine, beef stock, onion, leek, carrot, garlic, thyme, parsley stems, bay leaf, juniper berries and peppercorns. Bring to a boil, then lower the heat to a simmer for 1 hour. Skim the foam that floats to the top. While this is simmering, grill the beef short ribs. Drain brine from the beef and discard the liquid. Place the beef on paper towels, blotting the excess moisture, which will ensure a better sear and crust. While we smoke the short ribs at the winery you can achieve some of the smoky flavor by grilling the short ribs on your barbecue. Bring the barbecue to a high heat and cook the short ribs until you have considerable color on all sides of the beef, about 1 minute on each side. Take care not to burn the beef as that will lead to a bitter note at the end. You will not need seasoning because of the flavorful brine. At this point the braising liquid should be ready to strain. Reserve the liquid and discard the vegetables and flavoring. Place grilled short ribs in a deep baking dish. Add the braising liquid so it nearly covers the beef. Reserve the remaining liquid for finishing the reduction sauce. Tightly cover the short ribs with aluminum foil or a tight-fitting lid. Place in a 300°F oven for 4–6 hours. 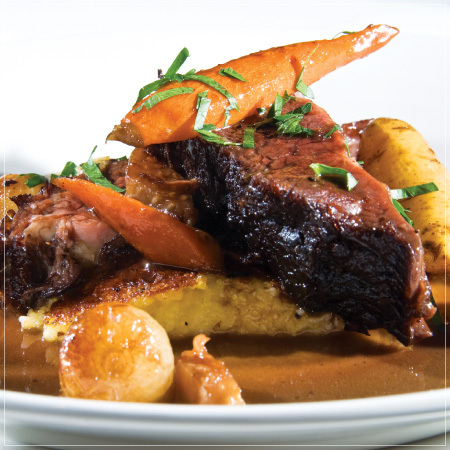 The alternative is to turn your crock pot to a low setting and braise the short ribs overnight (12–14 hours). When short ribs are fork tender, allow them to cool in braising liquid, which will lock in the delicate flavors. To make the jus, combine equal parts of the braise with the reserved braising liquid. On the stovetop, reduce by half, skimming the fat from the top. Return the short ribs to the reduced liquid, and heat in a 350°F oven until hot and serve. Roasted potatoes and carrots make a great side dish. 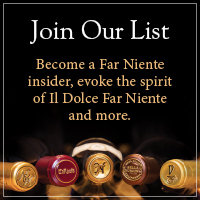 Enjoy with a glass of Far Niente Cabernet Sauvignon.